Nicest Yak set we know of. 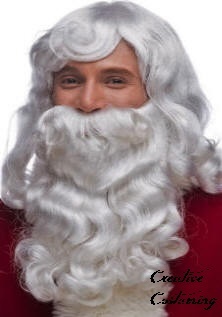 For you real bearded Santa's, the wig is available separately. mustache & beard (as shown left). Fine extra full Yak hair set w/mustache seperate (as shown left). All sewn on fine lace. Very light to wear. Styled beautifully. Skin Top. 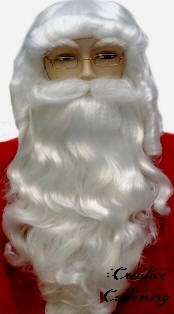 Beautiful fine quality extra full Yak Hair Santa skin top wig in natural white color. We just wanted to send a message to tell you how happy we are with your product. We have been getting so many positive remarks about the beard being so life like. 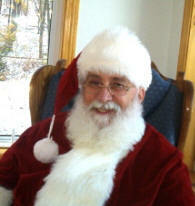 Santa is very proud of his beard & we can most certainly say we have the best Santa in town. Thank you so much for your business. 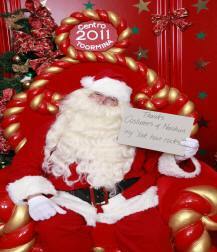 We have forwarded on your details to our shopping centre management as they wish to purchase another for our second Santa for next year. 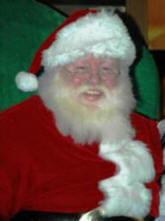 Once again thank you on Santa's behalf!!! 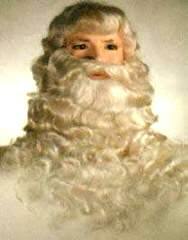 NB: Just some advice, we almost didn't buy your fantastic beard because of the over exposed picture on your website. 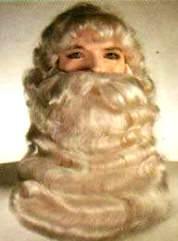 The picture you use to advertise the beard really doesn't do the beard & wig justice as the customer cannot see the quality & detail. Cheers! 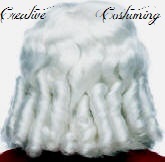 High Quality Kanekalon Wig Fiber! 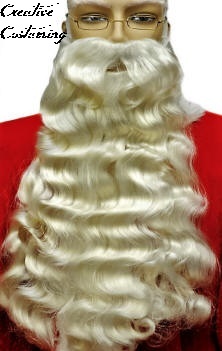 .Nicely styled High Quality Hair Fiber. 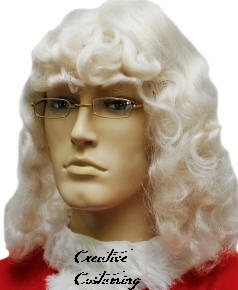 provide the most natural look! 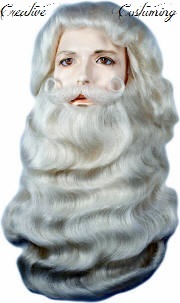 3 piece set includes wig with size adjustment, beard with chin cup and sturdy strapping, and excellent quality 7" wide moustache. All with quality lace backing. 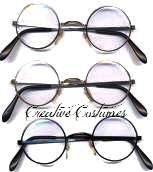 Additional (extra) matching moustache available seperately HM713812 @ $17.99. 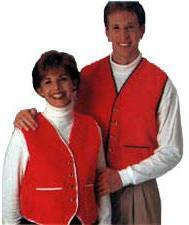 Color is actually same as the set pictured above. Not gray as pictured. 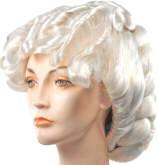 Back of wig is long finger curls. 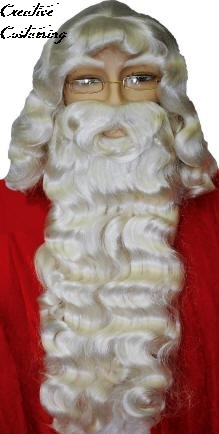 Curly Beard with tight Barrel Curls at the end. 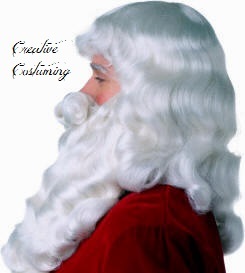 High Quality Washable Kanekalon Wig Fiber! 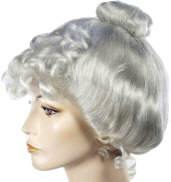 Full Wig Cap with elastic straps. Beard with attached wired Mustache. 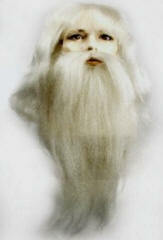 Fabulous deluxe Kanekalon skin topped Wig & Beard set. Thick beard with attached wired handlebar mustache.  is human white color (slightly silver). for larger size head #LW52.507.55 @ $129.99. 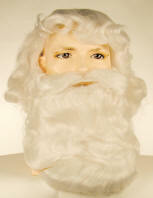 Available with XL wig cap for larger size head #[email protected] $139.99. fully backed beard that covers your whole chest. 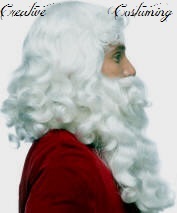 The beard is finely constructed with full backing, as many prefer. Mustache is wired. This set is easily washed & is human white color (slightly silver). Set comes boxed. for larger size head #LW51 @ $169.99. 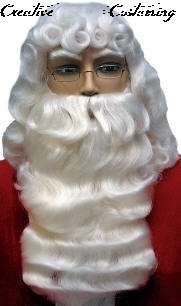 Very nice Kanekalon Santa set. whole chest, as many prefer. This set can be hand washed & is human white color (slightly silver). Set comes boxed. 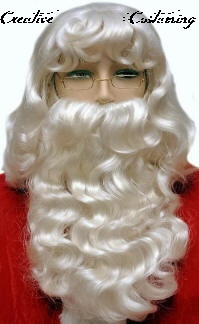 extra long beard # LW49.522.05 @ $169.99. for larger size head # LW51.512.55 @ $169.99. 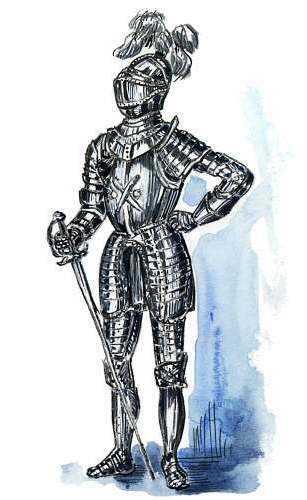 Version of above set that is even longer & wider (for a really big man). Beautiful Kanekalon Santa set. 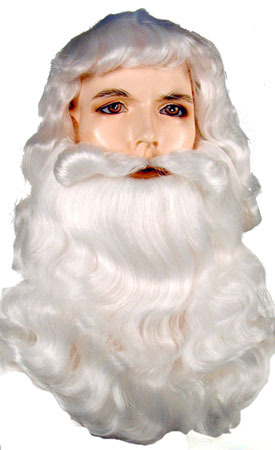 A fine skin top wig with an exceptional wide & longer beard which covers your whole chest. 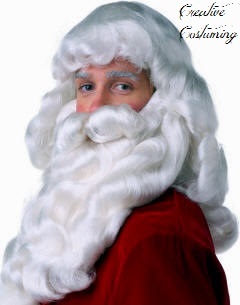 The beard is finely constructed with full backing, as many prefer. Mustache is wired. 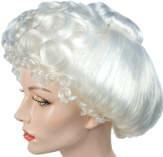 This set washes easily & is human white color (slightly silver). New version of above set that is even longer & wider (for a really big man). except the mustache is attached. Very nice set. 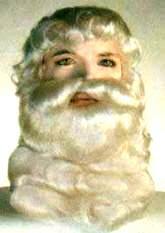 The same as Supreme Santa Set (L004), but with an added feature of a separate hand-made lace mustache, applied w/spirit gum. This set washes easily & is human white color (slightly silver). except the mustache is seperate. Very nice set. 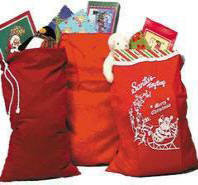 Super-high quality craftsmanship - all hand-made Kanekalon Santa Set for the ULTIMATE in style & durability. 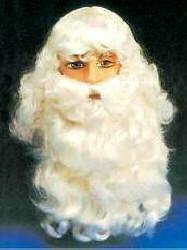 These Kanekalon Sets wash easily & are human white color (slightly silver). 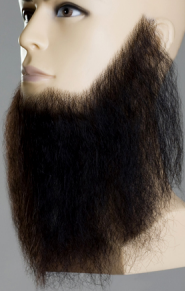 towards the bottom to create the most natural appearance, double elastic straps on the beard ensure an extra secure fit. 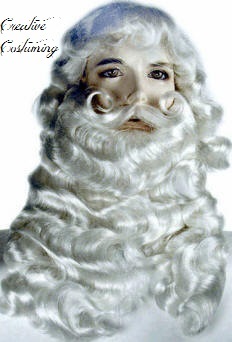 Wig and beard set with separate mustache. Also, works for Viking or Biker. Nice set with very long beard & wired mustache. 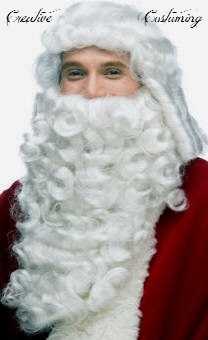 Good 19th century straight Santa style. 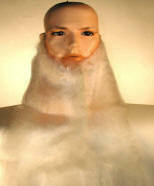 Nice set with very long beard & wired mustache & skin top wig. 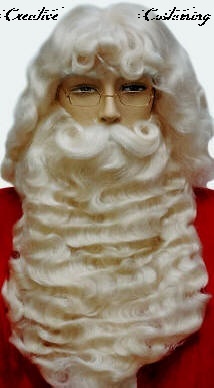 Good 19th century straight Santa style. 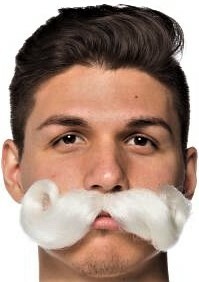 for easy fit & wired mustache. 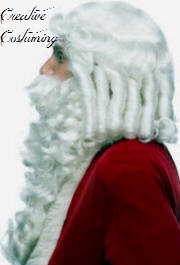 Good 19th century straight Santa style. 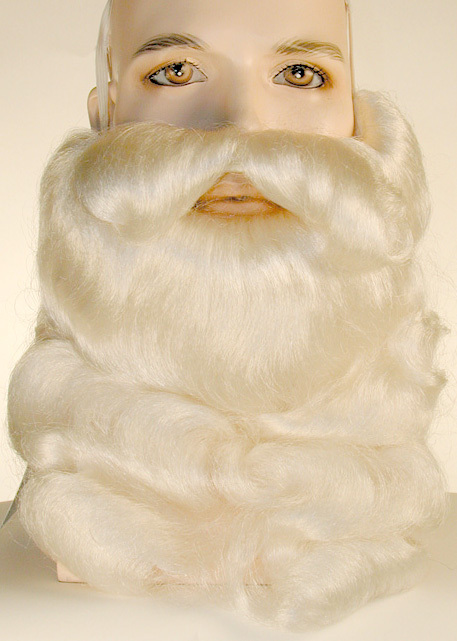 Nice set with white bald fronted straight wig with white beard and mustache. 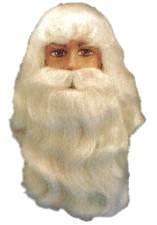 Also, available with a full wig (instead of bald) Please specify. 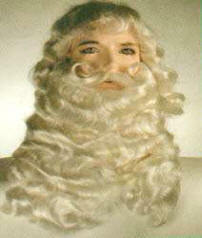 Full wig is good for Rip Van Winkle. 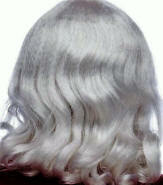 White Bald Front straight wig also available seperately LW589.575.55 @ $59.99. 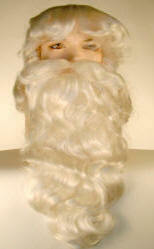 White Beard also available seperately LW674.562.05 @ $44.99. wired mustache for easy shaping. 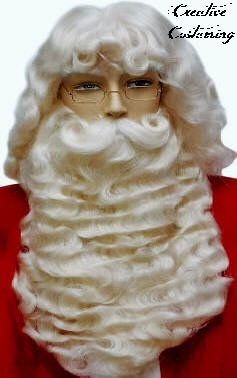 Recommended as a very nice medium priced straighter Santa set with wired moustache. Similar to LB367Cv2 (above) but a less expensive fiber. 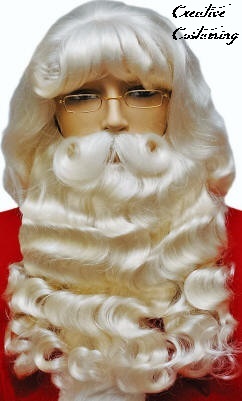 Medium priced straighter Santa set with wired moustache. 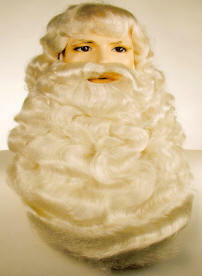 Inexpensive Wig & Beard Set with wired mustache & made with washable fiber. 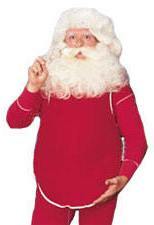 Nice Lower priced Santa Set. Lesser quality fabric then above version. Recommended as a very nice economy set. 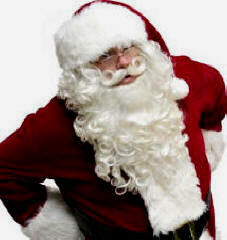 Lowest price Santa. The best deal for low end! with wired mustache. Set comes boxed. Gorgeous full upsweep with lush ample curls. 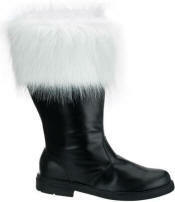 Works for Gibson Girl, Cinderella or Mrs. Claus. Same as Above - Back View. White with Long Banana Curls. 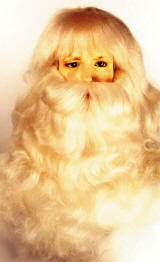 Fabulous Santa off white beard with lace-net backing for the most realistic look you can get. Requires spirit gum for adhesive. elastic straps or chin cup. A great realistic-looking mustache made of beautiful, durable hair. 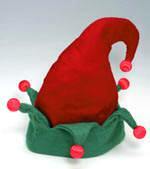 Attaches with spirit gum, available seperately. 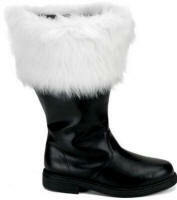 White is excellent for Santa. Excellent quality 7" wide with lace backing. Very Good quality. 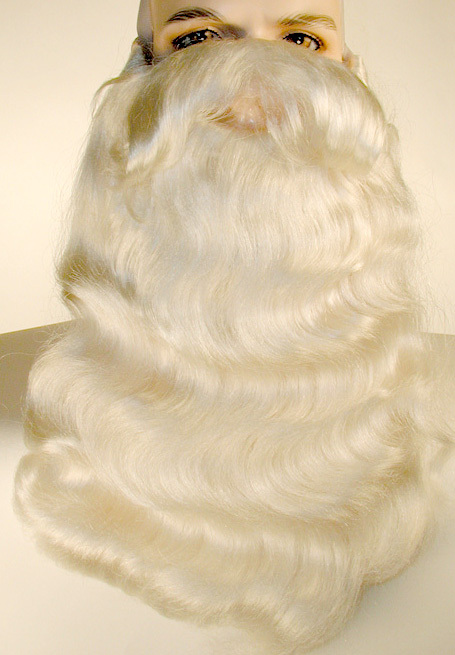 Hand-made synthetic hair. 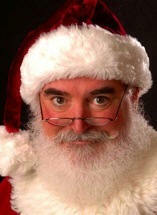 Santa Eyebrows Finest & Natural Looking. Big & bushy on lace backing. Provides rich vibrant color using very little product - thanks to a highly-concentrated matte pigmentation formulation. May be applied by itself or w/cake or cream makeup. Mehron’s Precious Gem Powders do to your skin. 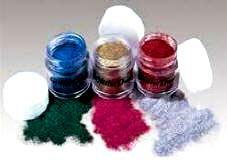 Precious Gem Powders are so versatile they’re great for adding sparkle to eyes, lips, cheeks or just about anywhere. Try these powders for everyday makeup, proms, runway, print, theatre, dance recitals, face painting & much more. Each Precious Gem Powder comes in an easy to use twist top container w/a shaker top. This powder formula is fabulous for a light colorful sheen or intense, water-resistant, colorful designs anywhere you dare. face painting or plain party fun! 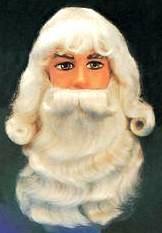 Please plan ahead when you order Hair White can only be shipped using ground transportation. Also, may also be applied w/a toothbrush. hair color & becomes darker. 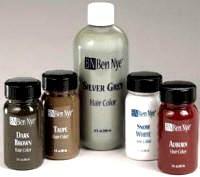 Hair White (left) & Hair Silver (below) are Professional Performance coloring used by the Makeup Artists of the Entertainment Industry to achieve a natural aging look in performer's hair. Water based formulas are a safe non-toxic hair coloring that can be used night after night for long Performance Engagements. Achieve the exact aging look you require with out damaging your hair. Easy clean up with soap & warm water. age tone with subtle metallic highlights. Dark Grey: This shade is a true deep grey. Taupe: Apply this subtle neutral brown on white to medium grey hair for a dramatic color contrast. match wigs & dramatic hair styling. Add to other hair color shades for tonal change. Snow White: Use to age dark brown or black hair. Streak into Silver Grey or Dark Grey to brighten highlights. 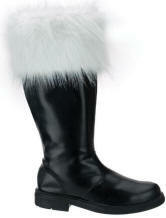 Excellent for Santa's beard & brows. 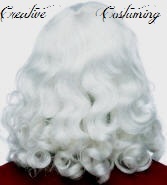 hair for unusual & dramatic effects. Caution: Black hair coloring may smudge. 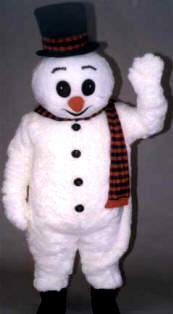 Avoid contact with hands & costuming. As with any adhesive, always perform a skin test 24-48 hours prior to your application. Note: Due to FAA Regulations this item can not be shipped air if over 1 oz. 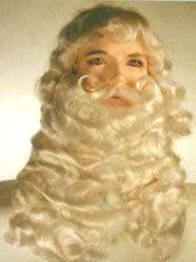 Requires Spirit Gum "P" Remover (below). 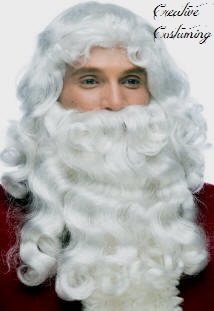 Specialized especially strong synthetic adhesive for beards, , wigs, toupees & small facial appliances. This product is especially useful when extreme perspiration or high humidity is a problem. As it is a sealer type of adhesive, it dries quickly. 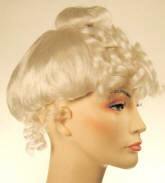 Therefore, hair goods & appliance must be positioned carefully as it is difficult to reposition them. Also, can be mixed w/normal types of spirit gum to strengthien their holding power. 1.75 oz comes w/a brush, 16 oz & 32 oz do not. K2041.558.29 4 oz. / K2044.553.70 1 qt..
Work remover under appliance with sponge tipped implement or a cotton swab. This dissolves the Spirit Gum & cleans up the skin. Note: Due to FAA Regulations this CAN NOT be shipped air if over 1 oz. FAA Regulations prohibit this item shipping air if over 1 oz. S calf measures 16" & boot is 16" high. Rental includes vest - not shown. Rates start at $195 per visit. 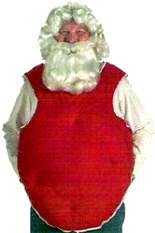 Call Costumes of Nashua early to schedule as he is a busy guy during the Holiday. the set becoming frayed and tangled. 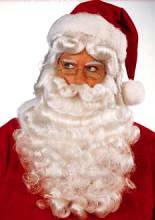 For our Afro American Santa. 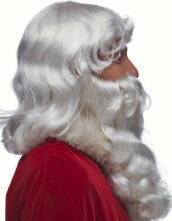 The set reflects the tone & texture of black hair for a man at Santa's stage of life. 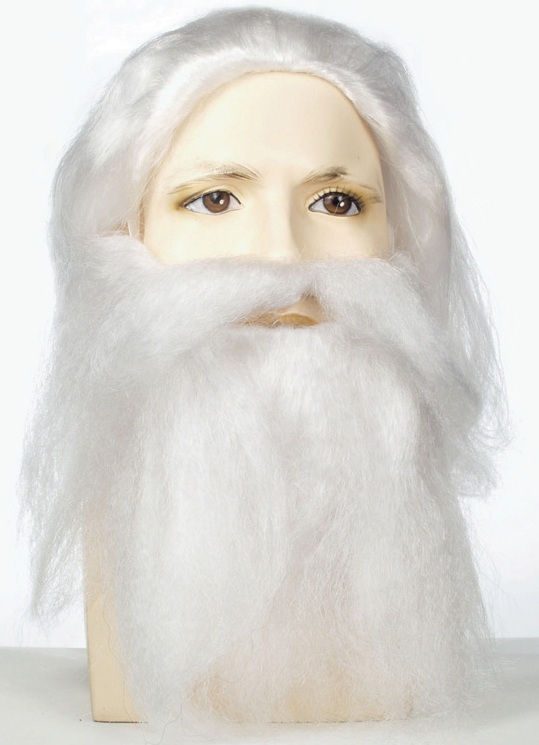 Wig & beard set with chin-cupped thick beard. Wired mustache. Set comes boxed. wired mustache & made with washable fiber. 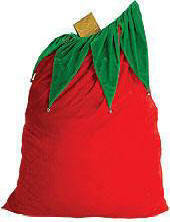 available @ $34.99 - lesser quality fabric. 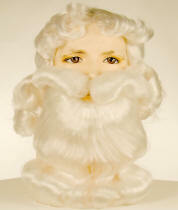 Fabulous Extra White Kanekalon wig and beard set with chin-cupped thick beard. Wired handlebar mustache. These Kanekalon Sets wash easily and are human white color (slightly silver). Available in extra large head size. 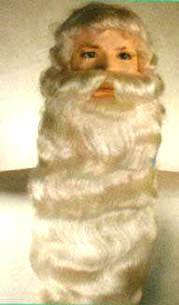 Like the Deluxe set (L001) but with a thicker beard & a skin-topped wig & wired mustache. These Kanekalon Sets wash easily & are human white color (slightly silver). Available in XL head size #L002EX.